Free downloads about fork lift safety, maintenance and more! Beach City Lift, Inc is dedicated to your success so here are some links and resources that can help. 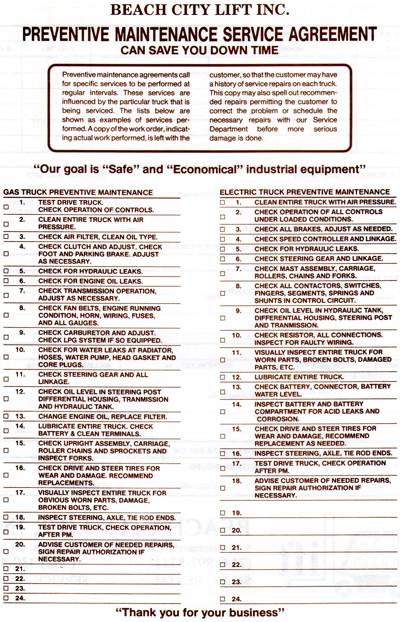 Use this daily checklist to remain safe and keep track of needed parts. Use this resource for the care and servicing of your batteries as the battery is key to your machine’s performance. Beach City Lift has the best sales and service in Southern California! Paint, parts and more! We love BCL!!! Need a lift? Beach City has them all! Forklifts repaired on site or at your business! Our parts and service can come to you! We service scissor lifts too! Need a part? We have it all! Need a belt? We have it all! Need a small part? We have it all!